Throughout the year, the Y hosts special events for adults, kids, families and the community. Y events are a great opportunity to have fun and meet new people in a safe and friendly environment. Everyone is welcome to attend this free event. Conservation personnel will be on hand displaying interactive exhibits including: live snakes, archery, laser shot, a fishing game, and a mammal fur display. Snacks will be provided. Join us at Simpson Park as we hunt for over 4,000 Easter Eggs. There will be four age divisions (1-3 years, 4-5 years, 6-7 years, and 8-10 years). A grand prize will be awarded in each age division to the child who finds the egg with “Grand Prize Winner” inside. Remember, the hunt only takes a few minutes, so don’t be late! 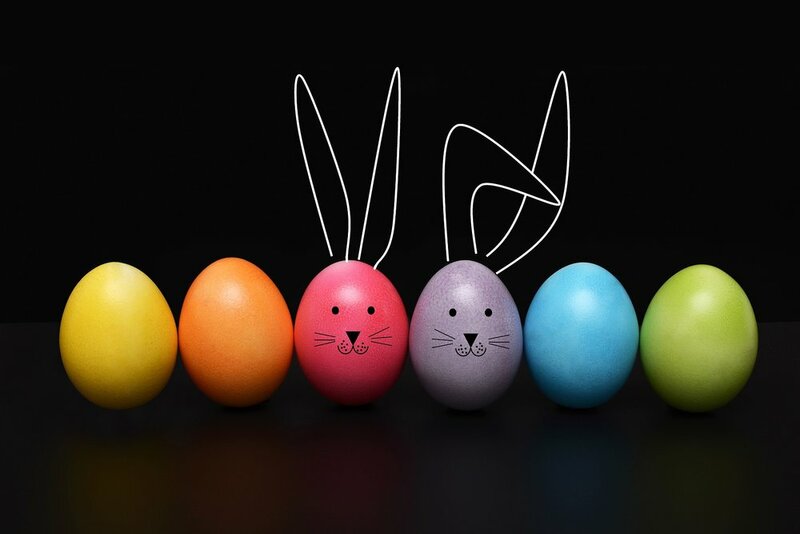 The YMCA invites all our young members (ages 0-10) to an "eggs"iting Easter event. Come jump, dive, float, and splash for more than 1,000 Easter eggs. This free family event is open to YMCA members only. We'll have a great time hunting eggs in age specific heats followed by prizes, snacks, and swimming. This event is free! All swimmers 0-7 years and any swimmers unable to pass the swim test, must have a responsible adult (16 or older) in the pool and within arms reach at all times. Join us for a morning filled with fun activities for the kiddos including bounce houses, face painting, healthy snacks, and a chance to visit with local emergency responders. Healthy Kids Day will be held Saturday from 10:00 am until noon. Calling all super moms, grandmas, aunts, and other beloved ladies. You're invited to bring your favorite young man to our first ever Mom & Super Hero Party. We're planning a mutant ice cream bar, photo ops, visits from your favorite characters, skill challenging games, and much more. It's guaranteed to be a blast, so grab your costumes, and meet us at the Y! Cost: $10 per couple, $3 per additional boy. Girls, come dance the night away with your favorite guy. Dads, grandpas, uncles, and even older brother are invited to join their best gals for a fun night of dancing and dessert. Commemorative photo packages will be available for purchase, starting at just $10. 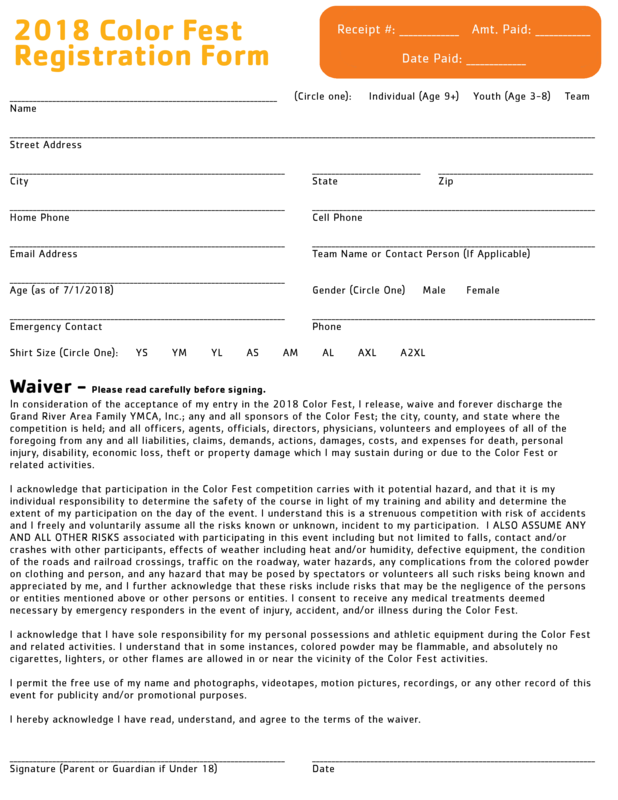 The Grand River Area Family YMCA presents the 3rd Annual Color Fest 5k Run/Walk! A part of the new Sliced Bread Celebration and Freedom Festival, this fun event promises to promote healthy living and comradery by bringing the community together with a whole lot of COLOR and FUN! Participants may sign up as an individual or as a team! Teams will consist of 5-10 people. All participants will receive a registration gift. An ending race celebration will be held with music, games, color, door prizes, color and MORE COLOR for all ages! Get your teams together!! We love our members. Let us say Thank You by joining us for a delicious, free lunch! Not a member? That's ok. Come see what the YMCA is all about. We know you'll love our members, too. This event is free! Date: Stay tuned for information about our 2019 event! Our Benefit Dinner and Auction is an exciting evening complete with a catered dinner, dessert, a professional comedian, and both silent and live auctions. The proceeds of the Benefit Dinner and Auction will support the Grand River Area Family YMCA's Partners with Youth Campaign. Partners with Youth helps finance many of the YMCA's philanthropic efforts. Each year we strive to raise more than $75,000 to fund programs like Y-PALS, our youth mentoring program; BackPack Buddies, a weekend nutrition program that feeds more than 250 elementary school children every weekend of the school year; and our scholarship program that makes our facility and our programs (including swim lessons and youth sports) available to low income children and families. Look for new challenges in 2019! Date: Splashing again in 2019! Come swim with the pumpkins! Open to youth of all ages. Each child will get to jump into the pool to claim their perfect pumpkin. Pumpkin picking will be followed by a time of open swim. Refreshments will be provided. For more information call the Welcome Center at (660) 646-6677. This event is free! Every swimmer 7 years and under must have an adult IN THE WATER at all times. Date: Be on the lookout for future dates! Date: We’ll be thankful again in 2019! Join us for a fun afternoon of feasting, fellowshipping, and giving thanks! We will provide the turkey and drinks. We ask that you bring a side dish or dessert large enough to feed 10-12 people. This is a free Members Only event. Please register at the Welcome Center by November 16. Date: Check back for information about our 2019 expo! Still need more ideas for Christmas. Visit the YMCA Christmas Craft and Vendor Expo and find the perfect gifts and décor to finish your holiday shopping off right. Vendor registration will be open September 1 until November 23. Calling all 5th - 8th graders! Come ring in the New Year with us. We've got a great evening planned with a live DJ, pizza, and more. All this for just $5. You won't want to miss the fun, so tell your friends and sign up today!